Nepal is one of the poorest and least developed countries in the world. 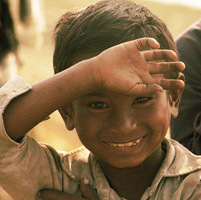 Despite the international aid which keeps the country afloat, Nepalese children do not have access to all their rights. They must live their lives mired in poverty, malnutrition, violence, and other harmful circumstances. Almost half the population of Nepal lives below the poverty line and cannot fulfill their families’ needs. Life for these people deteriorates daily in the face of unrest in the streets, inflation, etc. As victims of poverty, the children are in their hour of greatest need. They fight a battle for their lives every day, as their fundamental rights are not fulfilled. The Nepalese health care system has a serious lack of appropriate materials and competent workers. Health indicators reflect this: more than 45% of children perish before the age of 5, and 21% of young Nepalese are underweight. Children’s health is particularly vulnerable, and they tend to suffer from malnutrition and diabetes. The Ministry of Health, supported by many other organizations, has set up awareness programs, principally directed at mothers, to teach them to recognize the symptoms of childhood illnesses. Education in Nepal is free and mandatory between the ages of 6 and 11. This is not enforced, however, and many children leave school before their 11th birthday. Because of this, only 84% of Nepalese children attend school. Large gaps exist between the attendance of girls and boys, due to traditions which dictate the early marriage of young girls and the favoring of boys’ education. The educational system is also in a poor state. Factors such as mediocre teachers and a lack of buildings, materials, and personnel, all hinder the chances of attending school. 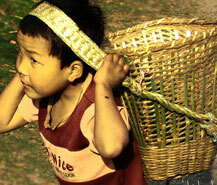 Child labour is a large black mark upon Nepalese society. Over 25% of girls work every day, as opposed to 17% of boys, since the latter represent a family’s future and are thus usually enrolled in school. Those who work do so to support their families’ needs, and they work in very dangerous conditions. Their duties vary by the job: they could be junk dealers, sweatshop workers, housekeepers, or weavers. They become vulnerable to many illnesses through their jobs. Child trafficking is altogether too present in Nepal, mostly because there is not yet a law against pedophilia. Many girls are torn from their families by traffickers because of this. Some will even decide to seek out traffickers themselves, looking for a better life. Once they arrive in cities, the girls are sent to brothels. Some may be as young as seven. This sexual treatment of young girls has hugely negative consequences on their future. Trauma, illness, and psychological disorders become their fate, due to the abuse they have suffered. The legal age for marriage is 18 for girls and 21 for boys. However, this law is not always respected: 51% of girls are married before that age. 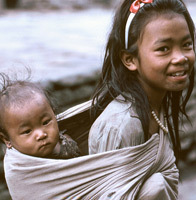 In many communities, such as the Newar community in Kathmandu, it is common for children to be promised to one another without any say in their own union. There are also some rites of marriage that can traumatize young girls, which many communities still perform. The country of Nepal is composed of many communities and over 90 Sino-Tibetan languages. The official language is Nepali, though, usually followed by English. Because of this, many communities cannot make themselves publicly understood, or send their children to school. In distant rural regions, primary schooling is usually given in Nepali, which many children cannot understand. This prevents them from attending school at either the primary or the secondary level. Nepal, whether a country or a conglomeration of multiple communities, does not yet have an effective government or judicial system. More than 30% of children, for example, are not officially registered with Nepalese authorities. This loophole causes serious problems for their lives. These children are invisible to society’s eyes, and they cannot take advantage of their rights, including education and health care.